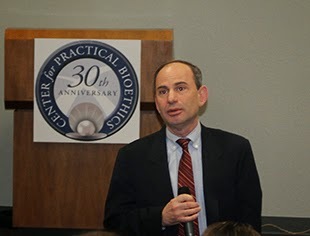 KCUMB hosted the Center for Practical Bioethics annual Joan Berkley Bioethics Symposium on April 25. We are pleased to share a close working relationship with the Center for Practical Bioethics. Tarris “Terry” Rosell, DMin, Ph.D., the Rosemary Flanigan Chair at the Center for Practical Bioethics, currently serves as KCUMB’s interim chair for the Department of Bioethics. In addition, Bruce Dubin, D.O., J.D., provost and dean of the College of Osteopathic Medicine, serves on the Center’s Board of Directors. 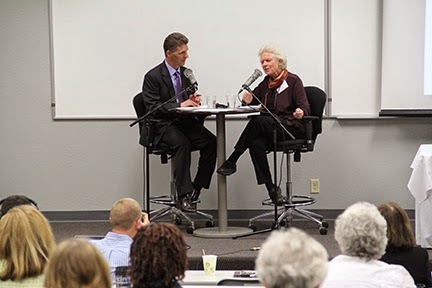 The symposium featured Peggy Battin, bioethicist and author of Least Worst Death. KCUR’s Up to Date radio show, hosted by Kansas City Star columnist Steve Kraske, broadcast live from KCUMB.